Building confidence in budding artists. 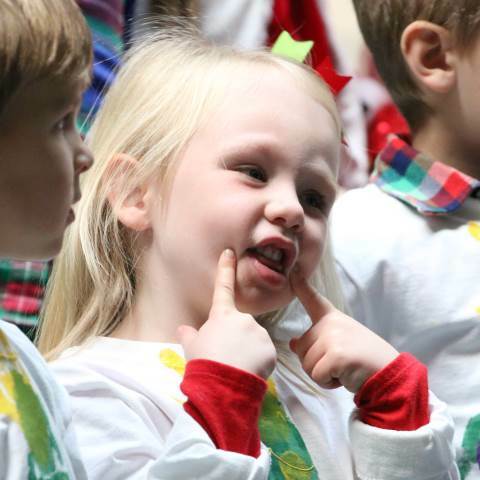 Our pre-K to 2 students begin to explore self-expression and the world around them as we introduce them to a rich arts education through music, theater and visual arts. Art activities are integrated into the curriculum whenever possible, which promotes creativity, enhances fine motor development, and boosts confidence. Our youngest students begin to explore, color, texture and sensory awareness through the visual arts. In our dedicated art studios, students use two- and three-dimensional forms to express their creativity. They also learn about art history through exposure to works of art and artistic styles in different cultures and times. All students in pre-K to 2 participate in the General Music class, learning through singing, dancing and playing instruments. Through these outlets, students learn to read, notate, and express themselves through music to allow for support in choices of vocal or instrumental study in grades 3, 4, and beyond. At Darlington, students are exposed to the art of theater beginning in pre-K with annual class productions. Through second grade, each class performs a musical once a year for parents, friends and peers. This allows students to not only experience the stage, but to build self-confidence at an early age by memorizing all speaking parts and working on their projection and expression. In pre-K through second grades, our students begin to develop lifelong skills and confidence through their class plays. Hear about the importance of this early time on the stage from their teachers, Molly Jordan and Beth Smith ('87).